We cordially invite you to participate in three international scientific events to be held in Santiago, Chile, between May 5-16th 2014. The international Symposium "Visualisation and Manipulation of Signals and Forces in Developing Tissues", the international Course "Optics, Forces and Development", and the OpenLecture series "Origin of animal form in evolution and development". These activities are sponsored by the Biomedical Neuroscience Institute (Chile), QuanTissue (ESF, Europe) and CONICYT (Chile), and aims to foster scientific interactions between Latin America and the rest of the world, and to disseminate the field of cell and tissue morphodynamics to the general public. 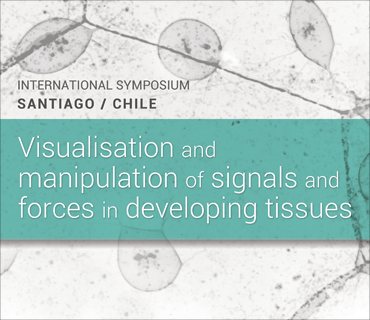 SYMPOSIUM 2014 : "VISUALISATION AND MANIPULATION OF SIGNALS AND FORCES IN DEVELOPING TISSUES"
Venue and Dates: Santiago, Chile, May 12-16th 2014. Aim: To foster scientific interactions between Latin America and the rest of the world by bringing together a small group of scientists interested in morphodynamics of cells and tissues from different perspectives: theory to experiment, molecules to cells, and cells to organisms. Speakers: Yohanns Bellaïche, Miguel Concha, Alvaro Glavic, Marcos Gonzalez-Gaitán, Valentina Greco, Stephan Grill, Anna-Katerina Hadjantonakis, Carl-Philipp Heisenberg, Antonio Jacinto, Roger Karlsson, Philipp Keller, Ray Keller, Ulrich Kubitscheck, Juan Larraín, Hernán López-Schier, Alfonso Martínez-Arias, Roberto Mayor, Stuart Newman, Ewa Paluch, Erez Raz, Didier Stainier, Masazumi Tada, Elena Torres-Padilla, Xavier Trepat, Julien Vermot, Primoz Ziherl. 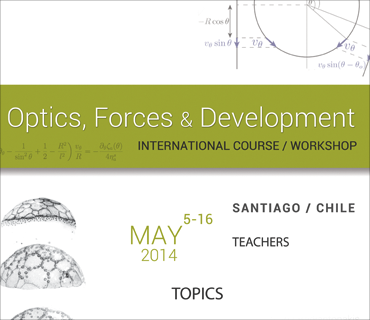 COURSE 2014 : "OPTICS, FORCES and DEVELOPMENT"
Venue and Dates: Santiago, Chile, May 5-16th 2014. Aim: To train a selected group of 12-16 students, postdocs and young investigators from Latin America in theoretical and practical aspects of in vivo microscopy, and strategies of visualisation and manipulation of cell and tissue morphodynamics in developing organisms. Topics: Principles of optics, in vivo confocal imaging, image processing and analysis, force estimation in cells and tissues, laser micro-dissection, cytoskeletal dynamics, model organisms, embryo manipulation, stem cells. Organizers: Miguel Concha, Steffen Hartel. 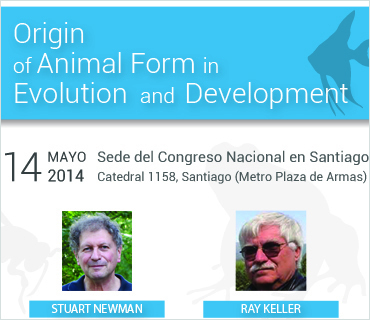 OPENLECTURE 2014 : "ORIGIN of ANIMAL FORM in EVOLUTION and DEVELOPMENT"
Venue and Dates: Santiago, Chile, May 14th 2014. Aim: To disseminate to the general public the current scientific view of how tissue and organismal form arose during evolution and development. Speakers: Stuart Newman and Ray Keller.